We've relocated to Forest City, Iowa! Hello! 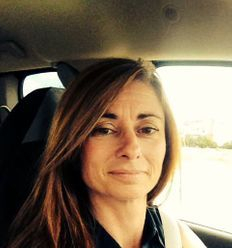 My name is Missy Sheffield, I am 38 years old and live in Tuscumbia, Al. I have been married to my wonderful husband Sammy for 6 years. We have 7 children and 9 grandchildren. I know your thinking how??? Haha! We are a big blended family 😉 David & Dayna Rice have Addison, Harper and Myles. Heather and Josh have Hope, Ava, Paisley and Hunter. Jacob and Brooke have Braylon and Ema. We have Braxton, Nate, Jillian and Noah. Ages from 35 to 2! 😀 I grew up watching my grandmother sew dresses for my sisters and I and was always interested in learning. I began learning when my my daughter Jillian was born in 2007. I learned a lot from friends and then mostly self taught myself. In 2011 my sister and her husband began the process of adopting our niece from China so that's when my gift of sewing was linked to Kingdom work I made crayon rolls, camera straps, placemats to help raise money to bring Ruthie home! ! Ian so excited and have started my own sewing business in my home called Sew4Him. I enjoy making a variety of handmade items such as nursery bedding, window treatments, memory blankets and much more!! And I'm looking forward to being a Ambassador for “DAG” God be the Glory!!! 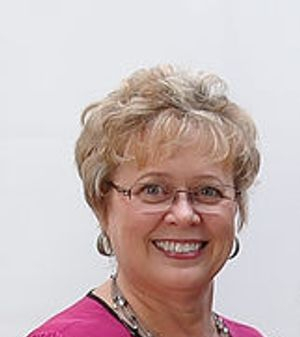 I have lived in South Arkansas all my life, and have been a Registered Nurse for 29 years. My husband and I have been married for 41 years and have 2 adult daughters who are married; I have one grandchild, who is the delight of our lives. 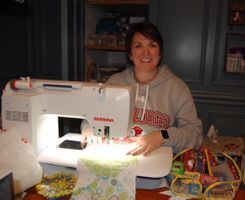 I will be retiring in the spring of 2018 and am always excited to find ways to use my sewing machine to bring comfort and hope to people going through hard times. My daughters and I make donation quilts for a children's hospital, and we give blankets with scripture verses sewn on them to cancer patients. My granddaughter is also learning to sew. They are helping make dresses for the Dress a Girl project, and we are teaching others at our church (who don't know how to sew) to sew the dresses. I also enjoy playing a violin, mandolin, and resonator guitar at church, and going camping with my family. 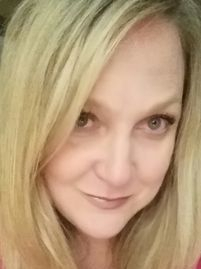 Hello, my name is Rose Anne and am excited to introduce myself as the Phoenix area Dress a Girl Ambassador. 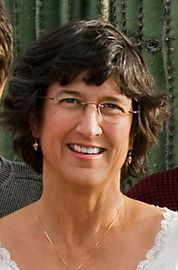 My husband and I moved full time to Sun City, Arizona from Washington state in 2010 after I retired from a long career in nursing at Seattle Children's Hospital. I remain a true to the blue and green Washingtonian, Go Seahawks! And try to go “home “ to visit a least a few times a year! I am crafter at heart and am still an avid card maker and quilter. I started sewing in grade school, making doll clothes, then moving on to my own clothes in junior high and high school. God lead me to DAG in 2011 through a friend at my church and I have been an active participant since. Dress a Girl is a passion that I love volunteering for. I am privileged to be blessing little girls all over the world with the beautiful dresses I and others make for them. 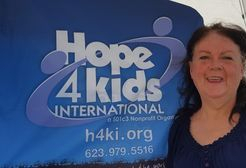 I was able to travel to Uganda in 2014 with Hope 4 Kids and Hope 4 Women, bring over 250 dresses with me. A highlight of that trip was dressing the sweet Ugandan girls in the dresses I had a hand in sewing! It was so much fun to bring home pictures and show the ladies at church little girls dressed in dresses they had made! 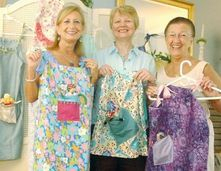 The Phoenix DAG group meets once a month to sew, sort and size dresses. We have fun and good fellowship while working together and a yummy potluck lunch is always shared. 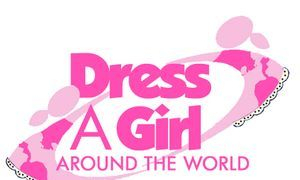 New friends are welcome, check out the Facebook page: Dress A Girl Around The World – Phoenix for details of our next Serve Day. A goal for 2018 is to start sewing classes at the Phoenix Dream Center, teaching the residents there how to make dresses for DAG, please pray for this project as we look ahead to next year! My mom taught me to sew as a child, and I made most of my clothes until I became a nurse, wife and mother of 4 handsome boys - my "mighty men." My sewing was limited to curtains, attaching Boy Scout Merit badges, Halloween costumes, and pajamas! I now have the joy of sewing with eyelet, lace and girly pink fabrics, and exploring the clearance racks for cute t-shirts in the girl's department! I am so excited to know that something so fun can bless little girls. Besides sewing, I also love to swim, garden and scrapbook." My name is Pat and I reside in the Central Valley in sunny California. 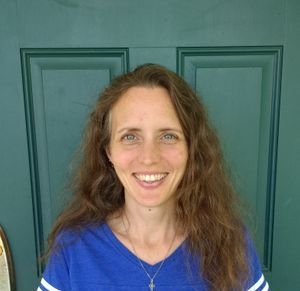 I am an elementary school teacher and I enjoy sewing, crocheting, and spending time with my family. 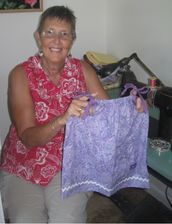 I began sewing at a young age and love giving my creations to family and friends. I came across Dress A Girl by chance while seeking an easy version for the pillowcase dress pattern for my granddaughters. I am happy I did because now I have the chance to make a difference in other young girls lives around the world. My future goal is to launch a ministry for this organization in my area, and to have others become involved who are passionate about children and serving our heavenly father. I've never been this aggressive before about anything. The Lord has opened so many doors that I know this is what I am meant to do. Thank you for inviting me. I look forward to doing the best job I can. 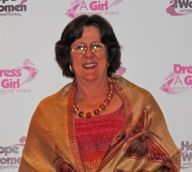 Sharon has been with Dress a Girl since August 2010. In that time, the Northern CA area has sent out more than 34,000 dresses to more than 42 countries. "This is my passion in life. Serving the Lord in this way is such a blessing. After seeing thousands of dresses, I never stop saying "so CUTE!" They bless the one who makes it, the one who takes it, & of course the girl who receives it!" We are Charlotte and Claudia and are super excited to be a part of Dress A Girl Around the World. We launched in 2014 in Fresno, CA under the amazing guidance of our sister in Christ, Barbara in Santa Cruz. Since that time our group has continued to grow and we have been blessed to be a part of planting or mentoring three other active groups in our area. We love Dress A Girl for the hope and joy it brings these beautiful girls in other countries and for the indescribable blessing it brings to each of us who has a hand in creating these special gifts. You can be an accomplished seamstress, a novice or a non-sewer to help, so please come and join us so you can be a part of this wonderful ministry and be a carrier of something special created in His name for those He calls His children. At Dress a Girl Around the World Santa Cruz we make our dresses “one at a time”. We want to send the message that each dress is made with extravagant love and care and is as unique as the child who will ultimately own it. 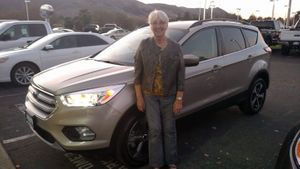 My name is Pamela Glenn and I live Arroyo Grande on the Central Coast of California. My mom taught me to hand sew for my dolls when I was 5 years old. As I got older I made my own clothes and sewed for my home and my children. About 2 years ago I discovered that I like quilting! 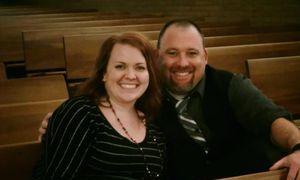 Our church was introduced to Dress A Girl when a new pastor and his wife came on board. This ministry has really captured my heart as well as many others in the church. At our first meeting, we completed over 100 dresses, some of which had been donated by another church in varying stages of completion. As I helped organize that day I realized that this was another “God” moment in my life - I had recently prayed the prayer of Jabez to “enlarge my territory,” so when I was asked to become the coordinator of the group, I said yes. We currently meet quarterly, but that may change as our ministry expands. As I write this I have gotten word that several other churches are interested in joining the team - how awesome is God! I'm Mary, aged 78 and widowed. Mother of 4 children. I've been involved with Peggy Wheaton's Dress A Girl, Precious Threads for 2 1/2 years. I now live in Paso Robles, Ca. The closest Dress A Girl is a 45 minute drive from my town and I wanted to start one here. First Baptist Church in Paso Robles has agreed to let me start a group in their building. I'm very excited to serve the Lord in this ministry. 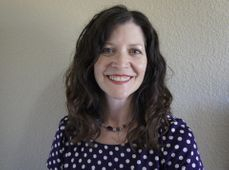 I live in Valencia, California with my husband and daughter, Sarah. I retired in December of 2015 and became an avid sewist. I love sewing for others and had been searching for an organization who could use some assistance. I’m excited to start a chapter in Southern California and providing dresses for girls all over the world. 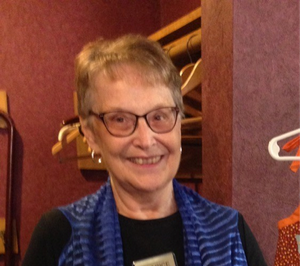 I have been sewing since 2nd grade, that makes it 58 years, and now have a business where I sew and sell Historical Clothing and patterns, mainly 19th Century, and hold Historical Sewing Workshops once a month. The parallels with the Ugandans living with no running water and no electricity seem familiar to me as a Civil War Reenactor, but I saw the extreme poverty, too, in the Tororo area. Experiencing the smiles, joy, and dignity that the girls exhibited when they received their dresses was very heartwarming. On a personal note, I lost my son when he was 14 1/2 in a dirt bike accident. He is safe in heaven now and God must have a sense of humor because I now have 5 tow-headed grandsons from my 2 daughters….. but no granddaughters to sew dresses for. Our church, Olive Grove Church, in Nuevo, is planning on raising money for a 3rd Well and we plan to go back to Uganda in 2020 for the well dedication. I plan to go again, but with suitcases full of dresses this time! I would love to encourage anyone to go as a Team Member or to help by sewing dresses with Dress a Girl! I am in the Inland Empire/San Diego area. Workshop days will be set up soon. Email me and join our Facebook page. My name is Vanessa , I live in Farmington, CT with my husband. Our 2 children have flown the nest and now I spend most of my time in my craft room. Being involved in DAG is the culmination of two passions of mine: global charitable work-where I can help make a difference in a girls life and sewing. There is nothing more loving than using ones talents to create something for another. I am excited to organize events where a community of sewers can get together to make beautiful dresses for lovely little girls. I discovered DAG in February of 2016 in Wells, Maine. I was visiting my sister and she had signed us up for a Sew-A-Thon, I said great. I had so much fun, I couldn’t wait to get home and start planning one. I had my first Sew-a-Thon in April of 2016, and went on to hold 3 more that year. I have met some really wonderful people at these events and happy to call them friends after sewing together and sharing a meal. 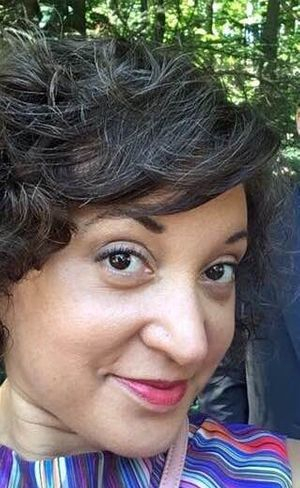 I was in the corporate world for nearly 30 years and am so happy to be out. It is nice to be able to take the time to create a quality garment for a girl who is in need and not worry about a bottom line! I have two grown daughters and a wonderful husband who has supported my interests and hobbies for nearly 40 years. 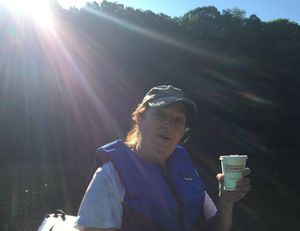 When not sewing I enjoy kayaking, bike riding, gardening and cooking. My name is Marisa, and I have lived in Maryland most of my life. I am married, and we are raising four children between the ages of 4 and 15. We keep busy with homeschool, church, and a small farmette. As I grew up, I watched my mother sew everything from curtains to my wedding dress! Finally, in Jan 2018, I learned to sew, and a friend told me about Dress A Girl. I was so excited to use my new hobby for the glory of God! One of my favorite Bible passages is Isaiah 58:6-8. I believe DAG fits that message: "Is not this the kind of fasting I have chosen: to loose the chains of injustice and untie the cords of the yoke, to set the oppressed free and break every yoke? Is it not to share your food with the hungry and to provide the poor wanderer with shelter- when you see the naked, to clothe him, and not to turn away from your own flesh and blood? Then your light will break forth like the dawn, and your healing will quickly appear; then your righteousness will go before you, and the glory of the Lord will be your rear guard." I look forward to hearing from you soon! Hi! I'm Kendra and live on the MA / RI border. I am blessed to be a part of this ministry to serve others and the Lord. I have been in the technology field for over 25 years and recently changed jobs, which has allowed me to spend more time pursuing opportunities to serve. I am active in our local church in the Toddler ministry, Gifted Ladies and Cleaning Crew. I am also a grandmother to five boys, so sewing dresses for little girls in a pleasure I don't often get to indulge in. 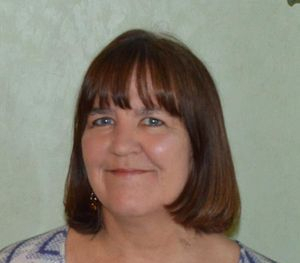 I am a recently retired school teacher who works in our local library in West Bridgewater, MA. Ever since my sister, Kendra Arocho, introduced me to Dress a Girl Around the World, I have renewed my love of sewing and creating. It has been a new found purpose for me serving alongside my sister, supporting the mission of Dress a Girl. Maggie & Cam! New Mexico! Hi! We are Cam & Maggie. We are both veteran home school moms who became great friends when we ran a homeschool science club and fair for about 5 years. In 2014, Cam heard about Dress a Girl Around the World through a Women of Faith conference email. Thinking that was a great idea, we gathered some ladies to brainstorm the possibilities with us. Along with our daughters, friends, clubs, and local churches, we began making dresses. Maggie's daughter Alyssa became inspired and soon became the local Junior Ambassador. Alyssa ran the show for a few years, holding workshops and enlisting several organizations to get involved. Now she is in college and Cam and Maggie are keeping the San Juan County chapter going. With our mixed skills and enthusiasm, and amazing women who have God-given sewing talent and creativity, we feel blessed to be able to be a part of this ministry! For a long time I looked for an opportunity to do something I would have a passion for and that would help others. 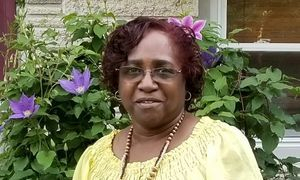 One day I read in the St. Mary of Vernon Parish (Vernon Hills, IL) church bulletin about a wonderful organization led by an amazing woman named Sidney that sewed dresses for poor girls. This sounded like something I could do and I attended the first event. Since then I have fallen in love with this ministry and am honored to be part of this organization. I do not have children of my own and this is truly a blessing for me to have the opportunity to make a difference in a little girl’s life. We recently moved to Colorado and I want to continue my charity work. I became passionate about this ministry and found a purpose that is beyond my own dreams. I would like to start a group of women here in Woodland Park, CO to follow a simple yet needed way to help poor girls own a dress. I will work hard to encourage people to get involved in making a difference in someone's life. If you like to sew, please join me. I would love to hear from you. I am honored to be an ambassador for the Southern Colorado area until Teresa, who did this job before me, will join us again. I had the good fortune to be raised in a Christian family that was always involved in mission out reaches. When I made a personal decision to trust Jesus, He gave me the same desires. I have been married to my dear husband for 42 years. We have 3 grown children and 2 grandchildren. My daughter told me about DAG. I was very interested, but because I was teaching at that time and didn't have the time needed to start something new, I filed the thought away. As a retirement gift, my husband gave me a beautiful sewing room. The stage was set. 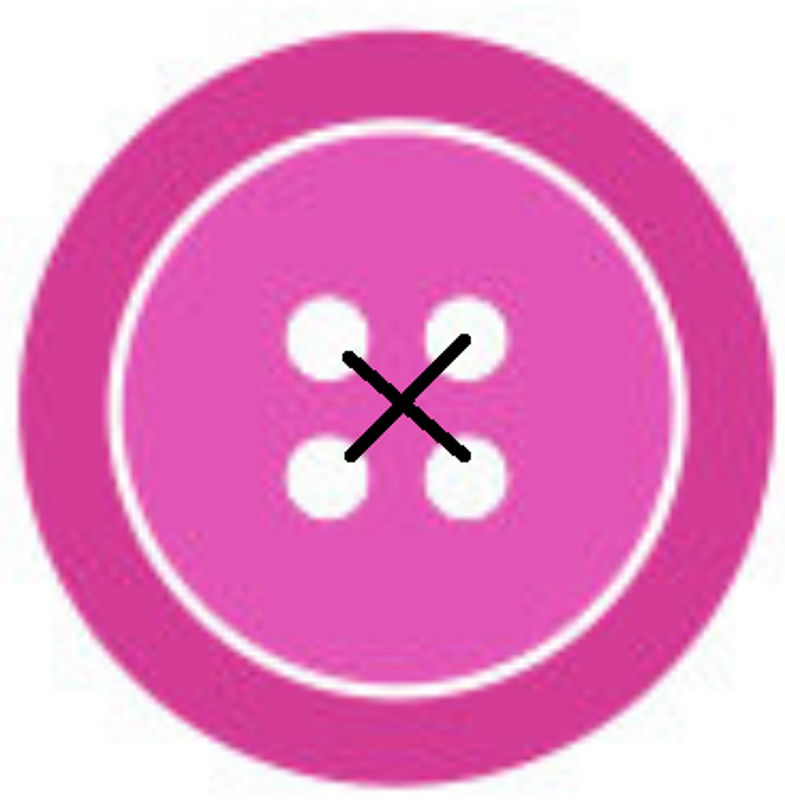 I went to the website, found the nearest group and attended one of their sew times with a dear friend. We came back to our church very excited with the thought we can be part of this wonderful ministry of sewing God's best dresses for His sweet needy girls. As I have talked to others about it, God has raised up a mighty band of faithful people who are part of our ministry. Our dresses are sewn one at a time and they are as unique and beautiful as the girls receiving them. As we sew we pray for the girls who will receive the dress and those who deliver them. It is an honor and privilege to be part of such an incredible ministry, spreading the gospel of Jesus Christ one dress at a time. After a long and successful career in the corporate world, I’m now retired and doing things I never had time for before. I lived in Atlanta for 15 years for work but am now happy to be back home in Jacksonville, FL where I’m blessed to be able to have my Mom live with me along with my rescued dogs Mandy and Pickles. 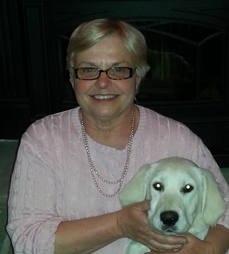 When I first heard about DAG from my neighbor Melanie, I couldn’t believe that I’d never heard of it before. What a simple concept with such a huge impact! I’ve gone on several mission trips in my life but nothing I’ve done feels as personal as this. Your effort, your creativity, your love for children, and your love for God are all rolled up into making these dresses. When I look at a dress, I think about the little girl who will be receiving it and how it and the message of God’s love will make a difference in her life now and in her future. I couldn’t wait to get involved and invited my Mom and sisters to get involved too. After attending several meetings, this like-minded band of women decided we needed a chapter in our area so we can help spread the word about this great ministry and offer others the opportunity to get involved. And you know what? Almost everyone approached has been interested in being involved in some way. Wow! Our God is an awesome God! I look forward to helping to make DAG a bigger channel for reaching out to the world with the message of God’s love. 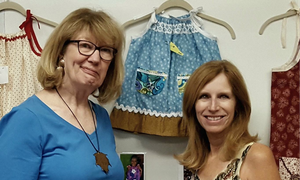 known as Dressed in Hope (DIH), which is part of Dress a Girl Around the World, has created an energy throughout Florida and across the country to help impoverished girls around the world. 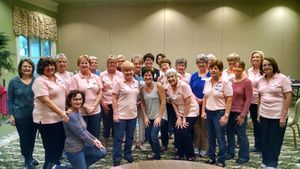 Our dynamic Orlando group has grown to over 50 volunteers. Courtesy of Village Walk, Lake Nona, Orlando, these dedicated women meet every Thursday from 10 -12 p.m. at its Town Center to create dresses and matching dolls that are “made with love.” The enthusiasm extends beyond the greater Orlando area, as we are fortunate to have talented “satellite seamstresses” in over 10 cities across the state and beyond our state line—from California to Connecticut. These partners have delivered over 650 dresses. The Dressed in Hope group hit an exciting milestone—since 2013 it has distributed over 2,700 dresses to 15 countries. Our success is a collaborative effort—from the generous donations of beautiful fabrics and notions to the personal distribution of dresses to orphanages by groups including AirMobile Ministries, Church of Nazarene, Delta Cares, Morgan Associates, Nautique Cares, Pine Hills Church in Indiana, Reach Out to Haiti, Ryan Epps Home, the Tebow Foundation, and the University of Central Florida Burnett Honors College. I have been sewing since I was 13 years old. I made all of my clothes in high school and in college. I began teaching elementary school when I finished college. Then I taught Jr. High science for 14 years. I retired from teaching in Texas after 27 years. In 2011 I lost my only grandson and then in 2012 I lost my only daughter. Sewing dresses for Dress A Girl Around The World helped me through some very hard times. 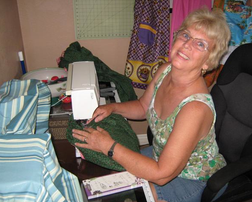 As I sewed, I began to find a purpose that was beyond my own needs. It did so much to bring me out of my grief that I consider sewing dresses to be a women’s ministry as well as a little girl’s ministry. I love showing women how valuable their contribution to world poverty is. As a child, I watched my mother sew the most beautiful outfits using newspaper to make her pattern pieces. I later found out that she didnʻt know how to read a pattern because she taught herself how to sew out of necessity simply by following an idea she had in her head. I didnʻt have that gift but I was determined to learn to sew like her. At the age of 12, I got hold of an “easy” pattern and some fabric and taught myself to sew by reading the pattern instruction over and over until I understood what to do. Over time, my skills improved and I have been sewing ever since. In my adult years, while serving in the youth program at church, I taught several of the girls to sew because I think itʻs one of those “must have” skills that helps make life easier. I first heard of the Dress-A-Girl-Around-the-World project from a friend who lives on another island and was contributing her skills by creating pockets. It didnʻt dawn on me at the time to get involved but as luck would have it, I came across the organization a couple months later which was an indication to me that I was to get involved. Iʻm excited to be part of this orgranization because I love the mission of empowering and valueing girls in my community and around the world. If you are interested in getting involved, please email me at: francine.dagatw@gmail.com. 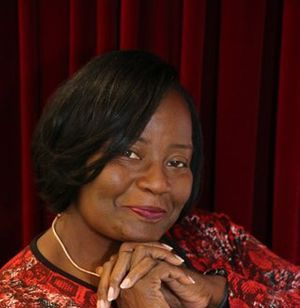 Hello, my name is Diane Jones. 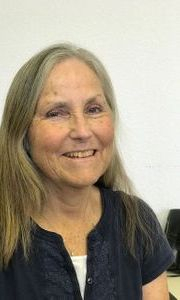 I am a retired educator with over 40 years of service. Dress A Girl has opened another chapter and opportunity to continue to serve. After reading about the ministry of DAG, and seeing the faces of the girls who were recipients, I knew this was a means to share the love of Christ in a tangible way. I believe that each DAG dress is blessed, carrying the message of hope, worth, and unconditional love. I learned to sew in elementary school, revisiting the art from time to time as needed. Making my first DAG dress rekindled a spark that I had not experienced for many years. Creating dresses that will both grace and protect little precious bodies, brings satisfaction beyond words. It is an honor and great privilege to lend support to such an incredible ministry, spreading the gospel of Jesus Christ, one beautiful dress at a time. I started sewing in Junior high school. I was never a fabulous seamstress but made curtains, simple clothes and projects of all kinds. I hadn't sewn in years but I became involved in Dress a Girl in Rochester NY. It was part of an organization called Angels of Mercy which addresses the abuse & trafficking of women. They started making dresses for DAG about 7 years ago. I loved the idea and joined in the group. 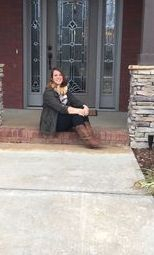 As a result of our daughter’s coaxing, last June my husband and I relocated to Des Moines, IA where she and her family live. From the day we made the decision to move, getting involved in DAG was my goal. I was driven to join a DAG group in Des Moines, to help me meet new people and make dresses for this wonderful organization. Much to my amazement, there was no such group and in fact hardly anyone had heard of it. Not to be discouraged, I decided to start a group. We moved into a senior independent living residence called the Reserve. With the backing of the Reserve staff, I was able to use our craft room which already had 3 vintage sewing machines and start DAG right here! We had the location; all we needed was the materials. There’s a church next door so I thought maybe we could get donated fabrics if they had any outreach programs. They invited me to speak to their ladies organization. As a result, their group gave us our first donation and the best part was that 3 of the ladies joined our monthly workshops. We bought some fabric, had an organizing meeting in February and our first workshop in March. We're a small group, but dedicated, and within weeks we had produced 45 dresses. We had no idea where we would send the dresses but I had the faith that by the time we had enough made, we'd know. By this time I was sure that it was what God had in mind when he sent us to Iowa. My husband and I believe in what we call God incidences. You know, things that happen without our direction and totally out of our control. Just like stopping by the church got us our first donation. One of our neighbors told us about a friend who has been flying humanitarian trips to Haiti since the earthquake back several years ago. These friends had shown him the dresses. As it turned out he had built an orphanage that was home to 72 girls. Did we cross paths by coincidence? I don't think so! And we had our first destination, and not because of us! After 4 months we have made almost 200 dresses and the involvement of 2 churches, a senior center and the commitment of our Drake University women’s basketball team to donate hours of community service to DAG. It’s growing faster then I ever imagined. We have been blessed in so many ways and I truly know that this is God’s plan for me. If you're anywhere in Iowa and want to get a DAG group going, contact me. I'll do whatever I can to help you get started. The real joy comes when you see photos of the smiling faces of little girls as they twirl around in their very own dress. Knowing the pride, self confidence and feeling of being beautiful, they may be experiencing for the very first time! I grew up with my Mother teaching me how to sew at around age 12, then my Junior High & High School Home Ec. teachers took it from there! Being tall, I made a lot of my clothes, making pants, shirts & blouses. When my kids were little, I sewed most of their clothes, even taking apart a winter coat to make a snow suit for my daughter! 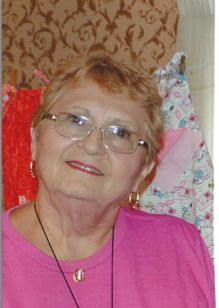 Now I do alterations for friends & relatives, sew curtains, purses, diaper bags, bibs & burp cloths & lots of dresses! Ten years ago, a friends Grandmother told me about Dress A Girl & gave me a pattern to make a pillowcase dress. Since I didn’t have any pillowcases, I used fabric left over from our kids, when they were little. They turned out so cute & I was hooked! Since Iowa winters can be cold & snowy, this is the perfect time for me to sew & in February I posted four dresses & a little write up about DAG on FB. Gals started contacting me, even teenagers & I am giving presentations on how to make the dresses. I feel so blessed to share & teach others my God given talent, knowing how these dresses can change a girl’s life. I love helping others, especially little kids in poor countries. I live on a 540-acre Century Farm in NE Iowa. We raise corn, beans, alfalfa, oats & have a 100 head black angus cow/calf operation. 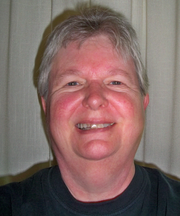 I’ve been married 41 years, have 3 married children, 8 grandchildren & work part-time in a Podiatry Clinic. Besides sewing, I help my husband on the farm, make greeting cards, love to walk, do crafts, bake, feed the birds & love spending time with family & friends. When I retire, I plan on doing missionary work & would love to see how happy the dresses make the girls & the expressions on their faces. There is nothing more precious than a child of God! How exciting to represent DAG in the state of Kansas! 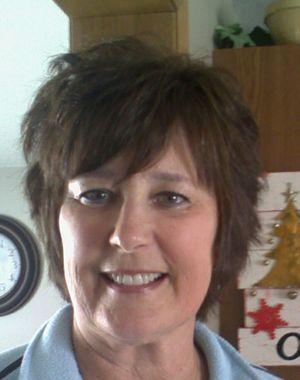 My name is Donna Waterson and I’m a retired art teacher. One afternoon my sis Shirley called to tell me about this amazing group in Ft. Collins, CO that got together once a month to make dresses for little girls throughout the world. Now, after I retired I prayed God would show me something I would have a passion for that would help others. This sounded like something I might be able to do, so I went to the DAG web site and the rest is history! O, by the way, that prayer started ten years ago! My timing and God’s timing were a little different. But of course His was perfect. Many of my church friends come twice a month to sew in the building behind my home I taught art classes in for thirty years. This building had just sat idle for the past ten years. Donations of sewing machines (15), more material than you can possible imagine, notions, ribbon, rick rack, thread, etc. All donated! God supplies everything! We started sewing last fall , sending dresses, baby blankets and little boys cargo pants to Honduras in March. We’re packing now for Togo, West Africa and Guatemala. Dresses for Kenya will go in the fall. We serve an amazing God! Hello, my name is Mary and I live in a small (pop. 800) town in Southwestern Kansas. I have stood with my husband in both local and international ministry for over 20 years. The ways God can use you to impact people around the world, even from a remote location, is amazing! Dress a Girl is certainly one of those ways. A few years ago, I was searching for organizations to be a blessing to when I came across Dress a Girl Around the World – DAG. I shared it with my sweet daughter Sarah, and since then she has become a youth ambassador for DAG. I have been serving her and others in a supportive roll, and now I am looking forward to serving DAG and working beside my daughter in a greater capacity by becoming an ambassador myself. I am thankful for this opportunity, and now there are two of us working to impact little girls’ lives from Southwestern Kansas. Psalm 144:12, Let our sons in their youth be as grown-up plants, and our daughters as corner pillars fashioned as for a palace. My passion is creativity. I’ve been sewing since I was 7 and quilting for the past 25 years. Retired, I began looking for a volunteer opportunity where I could use my creative skills as well as teaching and organizational skills. Early in 2018, I found Dress a Girl Around the World. I attended my first workshop and was hooked! I hold monthly workshops in Overland Park. Currently, my group is sewing for orphanages in Mexico, Peru, Puerto Rico and Vietnam, sending 112 dresses so far, with 24 going to Peru in January 2019. 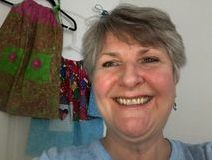 I will travel to your group to teach the dressmaking process, or talk with you about fundraising activities to support the mission. Be prepared for the most fun you can have with your sewing machine and one yard of fabric! 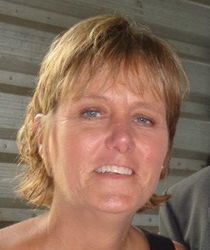 I am Susan and live in Covington, LA with my husband Gary and two children Abby, 13 and Sophie 10. I have been sewing since I was 14 years old and still enjoy it. I am very excited to be apart of Dress a Girl around the World and to be able to offer my gift of sewing. God has blessed me in so many ways, that I am so glad that I can give back. I own Create a Trip Travel Agency of 20 years and work as a Real Estate Agent. I also am Louisiana State Classic Queen and Miss Heart of the USA Mrs. Division title holder and proud to have Dress a Girl around the World as my Platform. My name is Jackie Dewey. Dave, my husband and Lacey live in York, Maine a beautiful seacoast town. I had a calling to this remarkable ministry in 2016. I followed my heart and grateful for the life it has flourished into. In meeting so many people, amazing friendships have been formed. We have grown together in faith and as a community. I hear from sewers frequently that their lives have also changed with new purpose and direction. We focus on giving joy, dignity and safety to girls in need through our sewing. Pictures we receive from completed mission trips give us pride and satisfaction. As Mother Teresa said "We can do small things with great love". My name is Erin Davis. I'm a small town, Midwestern girl with a passion for Jesus. I was taught to sew by my mother at a young age and enjoy crafting in many different ways. My mother in law introduced me to this organization and I was instantly in love! It gave me a way to craft AND show Jesus's love to girls around the world. I went with her to my first sew-a-thon with her group in northern California and sewed my first dress. I knew then that I could bring it back home to Michigan and get others involved. I currently coordinate a girls ministry at my church and we have decided to partner together in this mission. I'm excited to help young girls here in Michigan give back to girls their own age all over the globe! I started sewing for Dress A Girl early in 2014 and love doing it. I started with some fabric and lace that my mother collected during her life, but I have added to my collection as sales happen. 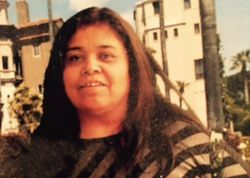 I am the mother of three grown children, grandmother to 14, and great-grandmother to one. I lived in England for two years in the 60's. That is where my oldest was born. That was a very interesting experience. Three of my grandchildren were born in Ethiopia and adopted when they were 3 - 5 years old. I traveled with my daughter and son-in-law to pick up the first child they adopted. On that trip, I saw first hand the state of development of one African country. We saw men and boys plowing fields with oxen and wooden plows. Some areas had no electricity. Clothes were washed in ditches running beside dirt roads. This brought home to me that great advantages that we live with every day and take for granted. That is part of my motivation for this ministry. I also want to do something useful with my time and resources. My name is Beverly. I was born and raised in St. Louis, Missouri. My parents instilled in me Christian values such as kindness, honesty, fairness, and volunteering which I have passed on to my children and grandchildren. I have been a FACS Teacher (Home Economics....I’m not afraid to say it!) for the last 37 years. I started teaching right out of college, and can still say, I love what I teach. I teach in an all-girls private school, in which, FACS courses are still being taught. These very important life-skills, such as cooking, sewing, child development, etc. are needed now, more than ever. My mom stayed home when my sisters and I were growing up, and was always teaching us practical skills. Young people, today, live in a completely different world. Both parents are usually working outside the home, which means family meal-times are jeopardized, and any extra time they have is usually driving their kids to and from extra-curriculum activities. It’s rare you will see a mother sitting down with her daughter, on a Saturday, teaching her how to sew! No matter what, I always had dresses to wear. Some were store bought, but many were hand sewn. It saddens me to think that there are little girls that will never own a dress. Getting involved in “Dress a Girl Around the World” is my way of giving back. I look forward to working with this organization, and making a difference in a child’s life. 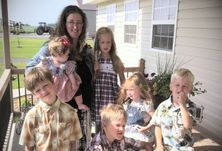 I am a wife and homeschool mom of 6 little blessings. Our family operates a small family farm in southern Missouri and my husband is also a pastor of a country church. Our family seeks to find ways in which we can serve others and show God’s love to the world which He created. I was so excited to find out about Dress A Girl Around the World and the mission opportunities it affords our family and community. I was reminded the other day of a Matthew 25:40 “Verily I say unto you, Inasmuch as ye have done it unto one of the least of these my brethren, ye have done it unto me. “ We are so blessed in our country and we take many things for granted. While our children “choose” what to wear and eat, other little ones around the world wear tattered scraps of cloth and go hungry. God honors and blessed the work of a faithful heart. We may have what seems to some as little to offer, but little is much when God is in it! We are looking forward to what God will do in Missouri! If you have any questions or want to donate your time, money or resources, please feel free to contact me! 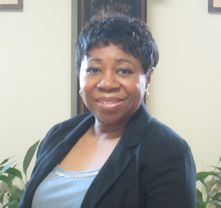 Toki has been working at Duke University Hospital since 1998. 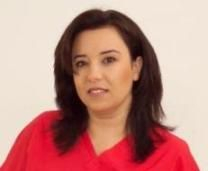 She has worked with Trauma and transplant patients and currently is a Quality Manager for Cardiac Surgical patients at the Duke Heart Center. 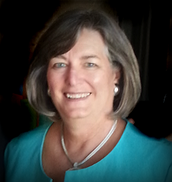 She graduated from Duke University School of Nursing with a MSN in Nursing Leadership and since then has focused on leadership as well as quality care of patients in different areas of service. She is bilingual in English and Farsi (Persian). Toki has a few hobbies such as water color painting and sewing. She has been involved with the Dress a girl project since early 2011 and is the company Rep for Duke in this project. I began sewing for Dress a Girl in 2011. When I retired in 2012 as a Hospice social worker,I wondered how God would lead me to fill my days. I soon realized that I wanted to be part of Dress a girl around the world & it's worthwhile ministries. I live with my husband of 36 years. We have 3 grown sons and 2 granddaughters, ages 3 & 17 months. 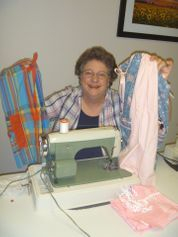 I enjoy sewing and crotcheting, traveling and spending time with our grandchildren. I am honored to have this opportunity to serve as an ambassador for Dress a Girl. 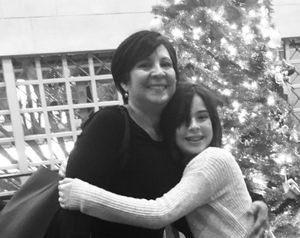 As a mother of two girls and grandmother to six granddaughters, I have a passion for all children, but especially girls. I come from a heritage of strong women, but also of strong men who respected and valued women. It breaks my heart to see any person not feeling valued and it often begins at a very early age. I can see where a pretty dress could make a difference in a young girl's self esteem and also how she is perceived by others. Sewing is something that has been a great hobby over the years, but recently, I have been blessed to share that joy with other young girls and their moms. When searching the Internet for simple dress patterns I stumbled upon your website. Such a simple dress, but a very obvious impact on these young girls. I am a member of Messiah Lutheran Church in Oklahoma City. I am truly blessed to be very happily married to Randy Baker for 33 years, and I am truly blessed to have 5 amazing children that are 14,16,19,21 and 24 years old. I am also truly blessed to be a part of Dress A Girl and Hope for Women! Providing a little piece of Hope to a young girl is an amazing feeling. By our commitment to give a little of our time and effort, we can help in the mission that “Every Girl deserves at least one dress.” I am a mother of 5 children, 4 girls, and a boy. I have been married for 20 years and am a follower of Christ. I started sewing when I saw a dress that I feel in love with at an auction I did not win and was determined to make it. After lots of classes, I made that dress. The feeling I got with that accomplishment made me move on to the next project..and the next project… I love being able to share my love of sewing and giving with others. I hope you will join me and send all your beautifully made dresses so I can help distribute them to these amazing, beautiful little gifts from God. I learned about Dress a Girl back in 2017. I have become an empty nester and even though I still work full-time I started praying for a passion. My pastor had been preaching on serving, giving back, using your talents and for about 5 months I had been praying for a passion. Asking, how can I make a difference? What can I do? One day on the news I saw an interview with a lady talking about how she made dresses for little girls in need with Dress A Girl. I stopped what I was doing and listened. It was only about a 2 minute interview so I started researching wanting to know more. Long story short...God opened the door to my new passion and I am so very thankful. What a blessing 2018 has been. 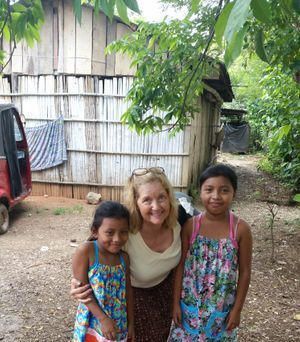 I went to Guatemala and took 206 dresses to hand out. I have seen God move and provide me with many God stories that I know without a doubt that this is what I am called to do. I have met so many wonderful women who are willing to help through this ministry. Remember, it's HOW we live our life; not how long we live. Be a blessing to others each day. For when we serve others, we serve Jesus. It is an honor and privilege to be a part of such an incredible ministry. I am so excited to see what God has for me and the DAG Ministry this coming year. So far I have a request for a need in Haiti. Contact me if you have any questions or are interested in helping giving HOPE one dress at a time. I have helpers from ages 9 to 91; sewers and non-sewers alike. Please let me know if you need an addiction because this is just the thing. One dress gets cuter than the next and I can't stop! Will you join me in making a difference in little girls lives around the world who may not even own a dress? My name is Michelle and I am currently a graphic design student at Drexel University in Philadelphia, but my family and home are in Torrance, California! I taught myself how to sew in middle school while looking for a new hobby. After hand sewing several dolls, my dad suggested I invest in a sewing machine. We split the cost half and half, and sewing has been one of my greatest passions ever since. I am so grateful that God has allowed me to find so much joy in my work, and I hope that through Dress a Girl I can help girls build confidence and grit while spreading God’s love to all His precious children. If you are near the Philadelphia area, or you are a student looking to get involved on your campus, please feel free to reach out to me at michelle.h.kim31@gmail.com! My favorite age to sew for is for ages two to 12 year old girls. Having five granddaughters has given me ample opportunity to be creative! They now have plenty of dresses that will be handed down to each other. About two years ago Dee, a good friend of mine, gave me two large boxes of material. Since the Grandorables had plenty of NiniLu (they call me NINI and I added the LU that stands for LOVES YOU!) dresses, I had to find a way to use this material. A quick search online for charitable sewing revealed the perfect answer for me. I could continue sewing for the age that I love as well as have a world wide impact. Each DAG dress is prayed over and is made with the same care and attention to detail used to make dresses for the Grandorables. We have a weekly workshop every Wednesday from 9-noon where we make Humanitarian Dolls and well as Dresses to send. I am ever so grateful to DAG for giving me the opportunity to make a difference. I find that “Sewing Mends the Soul”. My mother taught me to sew when I was about 10 and I never stopped. I use to sew for my kids when they were little but now they are all grown and have families of their own. So now it’s sewing for the grandchildren! My community is a host for welcoming immigrants and refugees from around the world. I have learned so much from them and where they came from and what they have been through. Their stories are heart wrenching. I was looking for a way to help and then I came across the Dress A Girl site I knew this was just what I was looking for. I am really enjoying designing cute dress so that the girls feel special wearing something pretty. I want them to feel that they are loved and worthy. I was born in Zambia and lived there until I was 7. As the daughter of a British banker, I was protected from many of the harsh conditions of such an impoverished country. However, I still remember the food shortages, specifically meat, and as for clothes -- forget it! My sister and I were lucky though -- my mother knew how to sew and we never went without cute little dresses! I’ve always loved all things girly, but as the mother of boys, I found that sugar and spice and all things nice was not the way I rolled anymore – flowers and fabric were traded in for fire trucks and football (and I wouldn’t change a thing!) – until I found Dress a Girl! Now I can pick out the pinkest and prettiest fabrics I can find and know they will make little girls somewhere smile. I also have my own skincare business and love to watch my clients become more confident as they transform their skin. However, creating beautiful dresses that not only carry a message of hope and love to those forgotten and neglected, but more importantly, keep them safe from predators is both humbling and delightful. The area in which I live is very service-oriented and I have high hopes for many dresses to be made here with great love. Being an ambassador for Dress a Girl around the world is a small thing I can do, and I am honored to have this opportunity to serve. Do not neglect to do good and to share what you have, for such sacrifices are pleasing to God, Hebrews 13:16. I have always had a passion for helping others and giving back. After recently retiring from working for the state(direct nursing care for 35 years) I continued to want to be apart of something that was empowering and could have an impact big or small in someone's life. I came across dress a girl around the world and after reading what this was about and stood for I decided I wanted to become apart of this movement and the fact that I enjoy sewing made it even better. Mary Jo & her Angels of Mercy are doing a phenomenal job in New York. 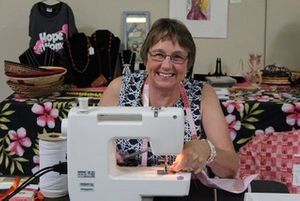 They are constantly in the news for their work with Dress a Girl and have had as many as 150 women show up with sewing machines in hand for events. They are going strong and have 40 locations sewing currently. From their base in Rochester they have made/sent/shipped over 88,000 dresses to Haiti, Peru, Nepal, Cambodia & France. 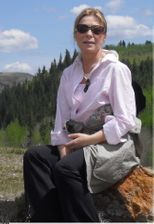 Mary Jo says: "Our goal is to reach the ends of the earth and we are on our way!!!!" "God is so Great…He sends women and girls with the heart to "SEW" seeds into the lives of young ones." 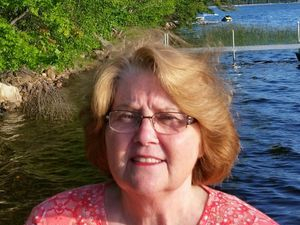 My name is Sharon Brown and I reside in the Long Island area in NY. Matthew 25:36a says " I needed clothes and you clothed me", if you have done it to the least of these you have done it unto me. 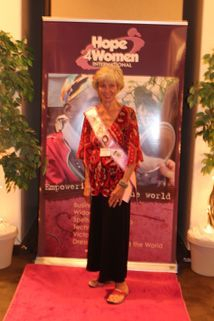 As I serve as an Ambassador for 'Dress a Girl Around the World" I am happy to render service to Christ. I am excited and honored to serve God's people through the gift God has given me. If you live in the surrounding area please feel free to contact me and let's work together! Making God's best dress for He's greatest gifts to the world ! I started playing with a needle and thread when I was 3 or 4 years old. My mom figured I would only touch the sharp point of the needle a few times before I learned not to. I started sewing my own clothes when I was 10 years old because the clothes my mom made for me were ugly. It was a pink and brown checkered double knit pantsuit that made me have to take matters in to my own hands! I grew up poor so making my clothes was necessary. I have always liked sewing except for having to sit still to do it! Recently, I wanted to find something to do to use my talents to serve God and help others. I started sewing for a group making baby items but didn’t have a passion for it. One day I looked online for other Christian organizations that I could sew for that I would have a passion for and there it was…Dress a Girl Around the World!! I knew immediately God wanted me to help clothe those precious girls! I’m excited to help provide dresses to girls in need. I want to help show girls around the world they are loved by Jesus and are beautiful in his sight. August 10, 2010. Channel 13 in Houston aired a news special about a group of people sewing pillowcase dresses for girls around the world. "I could do that!" Making a difference in the life of a girl whose eyes light up just to own a new dress inspired me to call the Dress A Girl contact. I joined and committed myself to this project to initially make 300 dresses that very night. I was excited to use my limited sewing abilities to a cause that was meaningful, simple to do, and at the same time contribute to making a difference in this world and to bless the life of a child. I joined the Dress A Girl community in 2010. We have two Sewfest a year; one in the fall and one in the spring. I've met so many wonderful people sewing, volunteering, delivering and working together for a common good. The community spirit and excitement fuels the energy at each Sewfest! I truly love sewing and to see your dress somewhere on the other side of the world is a feeling of joy I can't describe! To date, we've made 1,877 dresses and distributed 1,836. Living and Sewing to Serve is what I do! I live in a tiny town in North Texas a short distance from the Red River. A dear friend started a DAG group in Gainesville and we decided to expand westward. We are one group with two meeting places. 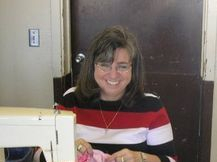 We sew dresses in Nocona, TX on the first and third Monday every month. A lady in our group has started using the small scraps to make lap quilts for a local nursing home. God is blessing people exponentially through Dress a Girl.